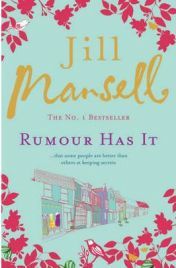 Jill Mansell is an author I’ve heard of, but Rumour Has It is the first of her novels that I have read. Chick-lit is a real hit and miss genre – its good authors write wonderful stories, but there is a huge amount of rubbish as well. So given that I was trying an author new to me, I went into Rumour Has It knowing it could be terrible – but as it was a purchase from the Kindle sale, I wasn’t losing too much. Tilly is a reasonably endearing, if stereotypical, heroine. She gets into slightly silly scrapes, she always looks at her worst when she sees the object of her affections, and she makes the wrong decisions before getting it right. I didn’t fully engage with her, but I found her a fairly pleasant character, enjoyable to follow and rarely annoying. The storyline of Rumour Has It is incredibly predictable. It’s a typical chick-lit story, where the girl is let down badly by a long term boyfriend, she moves away, meets someone who seems unsuitable, but there is hope of a happy ending. This isn’t even the first novel I’ve read where the heroine moves to a country village. But it is a story which works, otherwise it wouldn’t keep on getting told. And let’s face it, when you pick up a chick-lit novel you can reasonably expect to read this story in some form or other. Mansell tells it well, it is enjoyable and catches your attention, but I don’t feel she could be said to have put her own spin on it. There is little which seems truly original or inspired. That said, Rumour Has It is an enjoyable and light read, there is nothing really wrong with it even if it isn’t anything new. I enjoyed reading it, and while I won’t go out of my way to read more by Mansell, I wouldn’t avoid her novels either. No Comments on "Rumour Has It"